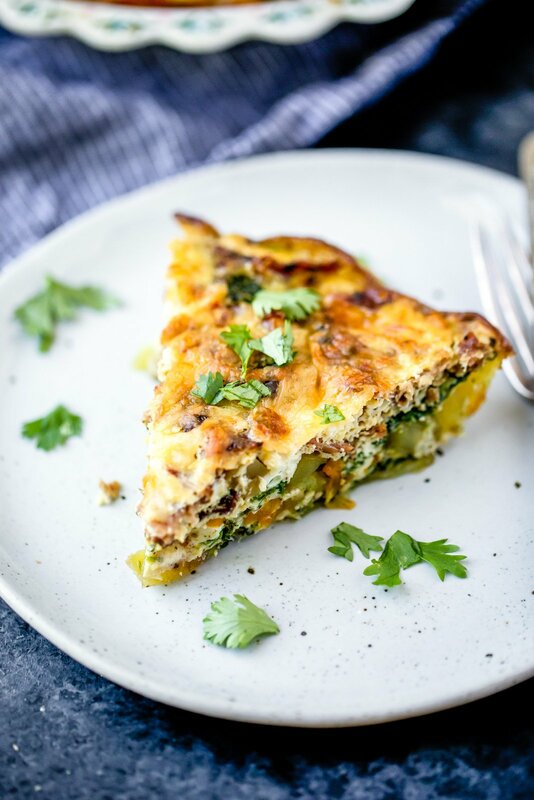 This veggie packed turkey bacon quiche is a protein packed breakfast that’s GREAT for meal prep! Make it and then enjoy slices all week long with hot sauce & avocado on the side. As you may or may not know, I had the BEST weekend ever with all of my bridesmaids for my bachelorette party in Scottsdale, AZ. It was such a relaxing, rejuvenating weekend full of amazing conversations, girl time, hiking, tacos, margaritas, guac + all the chips. I swear to you, my belly needs a break from tequila for a while. Anytime I get back from vacation, I find myself craving veggies in any form: I want spinach stuffed in my smoothies, hearty salads for lunch and a BIG bowl of broccoli with dinner. Basically I am the Hulk. 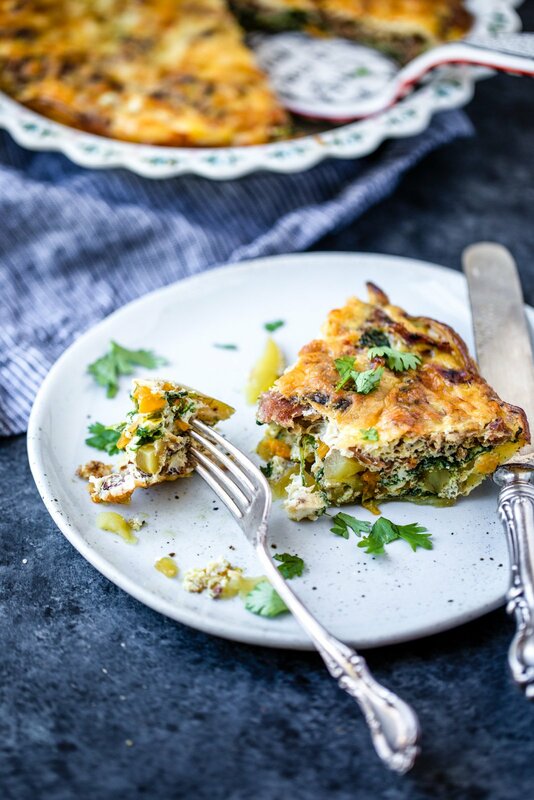 Earlier this year I made the most AMAZING quiche with a sweet potato crust. Plenty of you fell in love with the recipe for good reason. So I thought I’d make a new version that’s packed with protein, veggies and a little kick of spice to keep the metabolism buzzing all day. MEET THE JALAPENO, PEPPER JACK & TURKEY BACON QUICHE in all of its glory. So beautiful, so delicious and savory. Oh and guess what? There’s also a POTATO crust involved which makes me giddy inside. 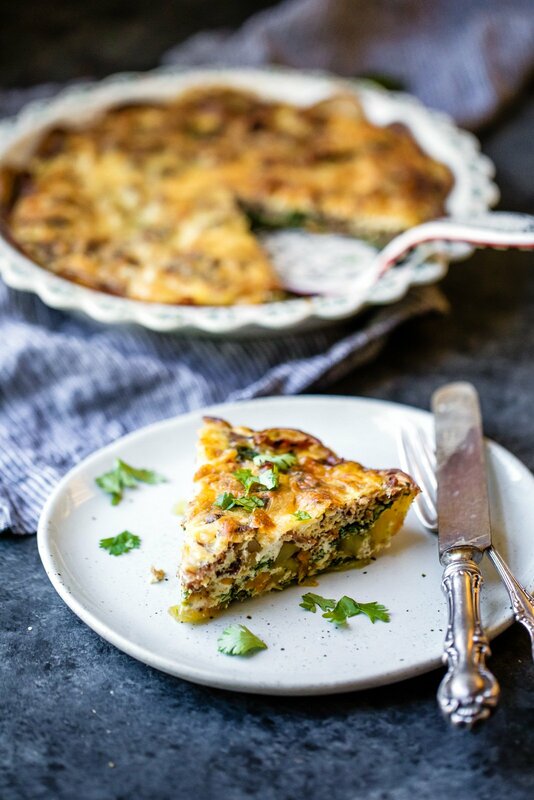 I’m not going to lie… usually I’m not a huge fan of savory breakfast recipes (bc I eat them for lunch instead) but this quiche has been a game changer for me. I love eating it with avocado, cilantro and hot sauce or ketchup. And guess what? You can feel free to get creative with this recipe. Add onion! Or chopped broccoli! Or asparagus! Abra and I make various versions of this every week and nosh on it for breakfast and lunch. It’s perfect for meal prepping too — just bake, then slice into individual servings for reheating. YASSS. I hope you love, love, love this recipe. If you make it, be sure to rate the recipe below and leave a comment. You can also upload a photo to Instagram and tag #ambitiouskitchen so I can see your creations. xoxo! Preheat oven to 375 degrees F. Grease a 9 inch pie pan with nonstick cooking spray. Add potato slices all around the base and sides. Cut some in half if you need them to fit on the sides. Spray the potatoes with additional nonstick cooking spray. Bake for 20 minutes. Once done, remove from oven and allow to cool for 5 minutes. Keep heat in oven. While potato crust is baking, cook the turkey bacon. After turkey bacon cooks, remove and transfer to a plate and set aside. Add olive oil to the same skillet you cooked your turkey bacon; saute jalapeno, diced tomato, and diced bell pepper for a few minutes. Then add spinach and saute for another few minutes, or until spinach wilts. Remove from heat and set aside. In a medium bowl, whisk together eggs, almond milk, salt and pepper. Add veggie and spinach mixture over the crust, then tear bacon and place on top of veggies. Next pour your egg mixture over the top. Sprinkle cheese on top along with an additional sprinkle of salt and pepper. Bake for 35-45 minutes or until egg sets and puffs up and becomes nice and golden. Remove from heat and allow to cool for a few minutes before cutting into 4 slices. Enjoy! Feel free to use sweet potato instead of regular potato if you’d like. To make vegetarian: Simply leave out the turkey bacon. To make dairy free: Skip the cheese.